Finally admitting this week that it has presided over a catastrophic 60 per cent collapse in its elephant population due to poaching in the past five years, the Government of Tanzania is still flailing around in denial. The Environmental Investigation Agency (EIA) has been investigating ivory trafficking out of Tanzania since the current upsurge in elephant poaching began in 2006 and in November 2014 released its landmark Vanishing Point report, which revealed that Chinese-led criminal gangs are conspiring with corrupt Tanzanian officials to traffic huge amounts of ivory. In an apparent bid to shirk official responsibility, the Minister of Natural Resources and Tourism, Lazaro Nyalandu, has partially blamed the 60 per cent elephant population decline on migration. The reality is that since January the Government has deliberately suppressed the elephant census figures, which show a fall in numbers from 110,000 in 2009 to 43,521 last year. Despite the census being conducted between May and November 2014, the results are only now being released, on the grounds that they needed to be validated or a recount conducted. 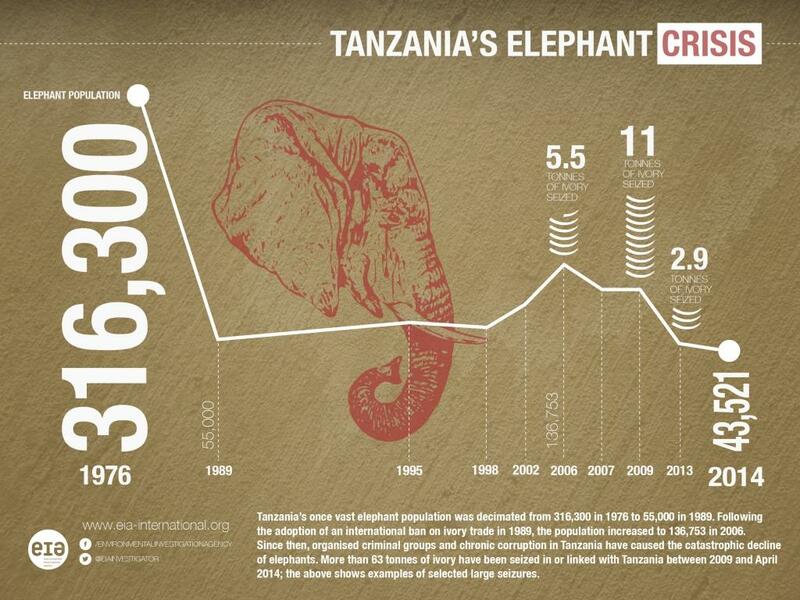 Tanzania has been here before – in 2009 a similar report highlighting a serious drop in elephant numbers in the Selous was buried. The figures, to great official embarrassment, were subsequently leaked at a major international meeting. Faced with such a major and ongoing crisis, the Government has defiantly moved to curb transparency on the issue when last month its Parliament passed an oppressive Statistics Bill which in effect allows it to bury any number of embarrassing realities by making it a criminal offence to publish data not endorsed by the National Bureau of Statistics. Earlier this year, the Government banned sales of The East African newspaper in Tanzania which, among other important issues, had also widely covered EIA’s Vanishing Point report. He further insisted: “Accusations the Government of Tanzania pays no attention to illegal ivory trade, and takes no action against culprits of the crime, are baseless.” This despite the report providing clear and entirely contradictory evidence – as of October 2014, just one individual has been convicted since 2009 out of 13 cases involving 26.5 tonnes of ivory and implicating several individuals and companies. Not a single corrupt official implicated in the trade has been prosecuted. Vanishing Point was widely shared with key Tanzanian Government officials and departments; to date, EIA has received no formal response. There have been indications that the Government is belatedly stepping-up efforts to tackle poaching and ivory trafficking but its record remains tainted with suppressed information: at the Botswana Conference on Illegal Wildlife Trade in March 2015, the Government made no reference to the severe decline in elephant population, instead choosing only to highlight cherry-picked positive examples of relative stability and bemoan its need of additional funding; and as recently as April 30, 2015, Tanzania National Parks issued a press release denying a decrease in elephant population in Ruaha and claiming anti-poaching efforts have reduced poaching in the area. This issue should be of serious concern for donors who are providing significant aid to Tanzania, which include efforts to combat illegal wildlife trade and strengthen Government accountability. In 2012, donors committed nearly $2.6 billion in aid for Tanzania, with the top donors being World Bank (approx $643 million), USA (approx $419 million), European Communities (approx $183 million), UK (approx $178 million) and Japan (approx $42 million). EIA Executive Director Mary Rice said: “It’s been nearly a decade since EIA first exposed the scale of poaching and ivory trafficking in Tanzania and, despite all the warning signals and the wealth of information available to the Government, it appears that no genuine effort has been made to contain the crisis and secure the future of elephants in Tanzania.